Six-sided die with Chinese/Japanese numerals. Ten-sided die with Chinese/Japanese numerals. Six-sided die with Arabic numerals. Six-sided die with Thai numerals. 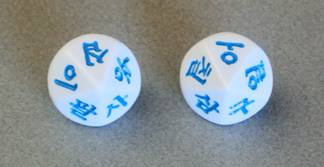 Ten-sided die with Korean numerals. Six-sided die with Hindi numerals. 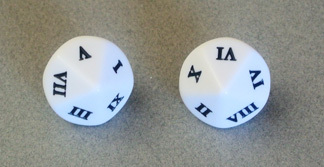 Ten-sided die with Roman numerals. 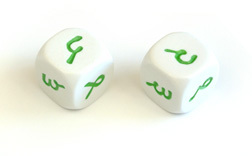 Ten-sided die with German words for the numbers 1-10. 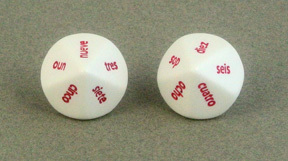 Ten-sided die with Spanish words for the numbers 1-10. 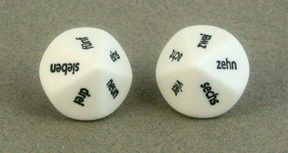 Ten-sided die with French words for the numbers 1-10. Large 26-sided die marked with the letters of the alphabet. Measures 30 mm across. Available in purple and black. 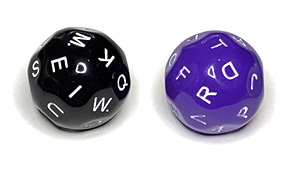 Jumbo 30-sided die with the letters of the alphabet on 26 faces, plus four "wild" sides. Only available in white. 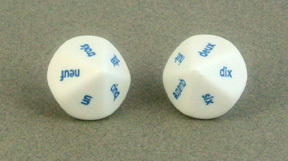 Six-sided die with differing amounts of US money, from 1 cent to 1 dollar.